French dishes using local ingredients in this restaurant overlooking the Pacific. 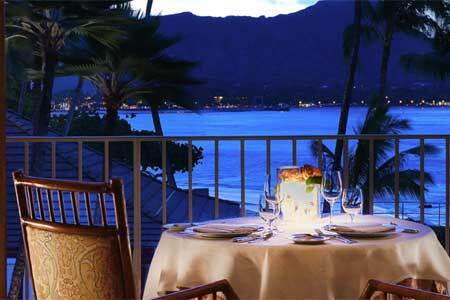 : La Mer is Honolulu's premier French restaurant. Fresh local ingredients like moi and opakapaka often form the foundation of its dishes, but they are prepared with traditional French techniques. La Mer offers a change of pace from the many Hawaii Regional options. Alexandre Trancher has taken over as chef de cuisine of the restaurant. Start with monchong carpaccio on a mango compote; morel gnocchi, Asian mushrooms, shaved Parmesan and morel cream; or lobster bisque “Marseilles-style.” Steamed sea bass is paired with spiced tomato chutney and chorizo cream. Other entrées might include Prime beef filet with foie gras, truffle mousseline, pommes soufflés and sauce Périgueux; and baby vegetables accompanying red wine-braised pork cheeks. The wine list continues the Gallic theme. For dessert, try a soufflé or perhaps the chocolate mousse with ginger cotton candy, pineapple and yogurt ravioli. The attentive service at La Mer is impeccable. The seductive open-air space overlooks the Pacific, and the low-lit rooms are lined with carved wood panels that ooze a seaside glamour evocative of Waikiki past. As you sip your Cabernet Sauvignon you can hear the lulling shorebreak, and the strains of Hawaiian tunes accompanying former Miss Hawaii Kanoe Miller and Debbie Nakanelua performing the hula at the historic House Without a Key below.